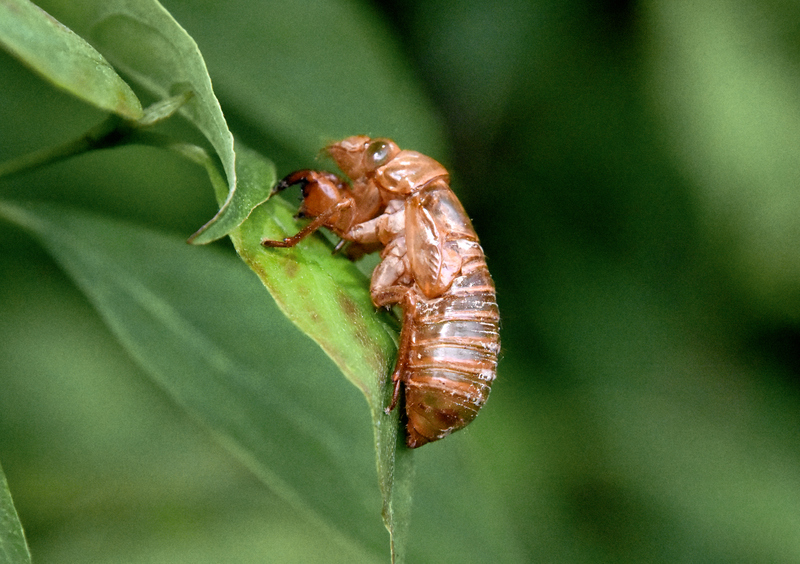 Periodical cicadas called Brood V have emerged from the ground after 17 years of life as a nymphs feeding on the juices of plant roots. It took me a week of attempts to locate a local population of these amazing critters. I hiked several miles through nature preserves with no success knowing that they had been seen in many places in eastern Ohio. Finally, I took my family back to Kendall Ledges in the Cuyahoga Valley National Recreation Area between Akron and Cleveland OH yesterday. 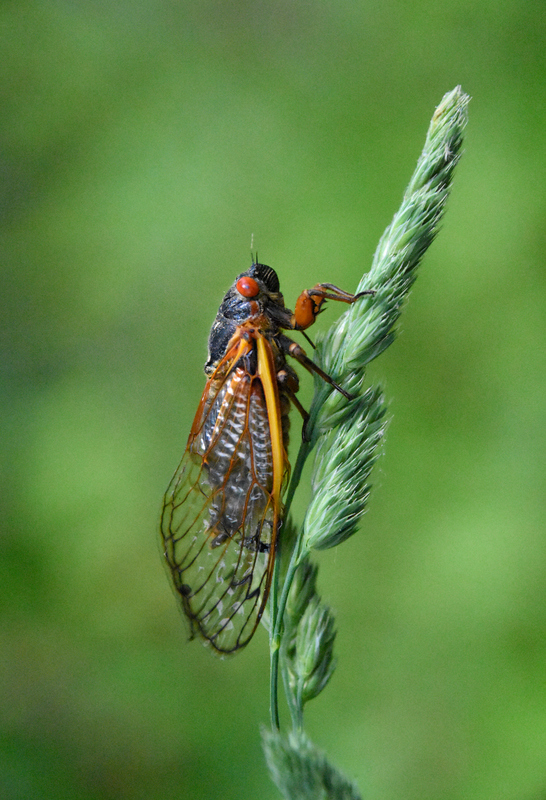 I had been there two days earlier and saw only a single cicada despite walking over a mile through woods. 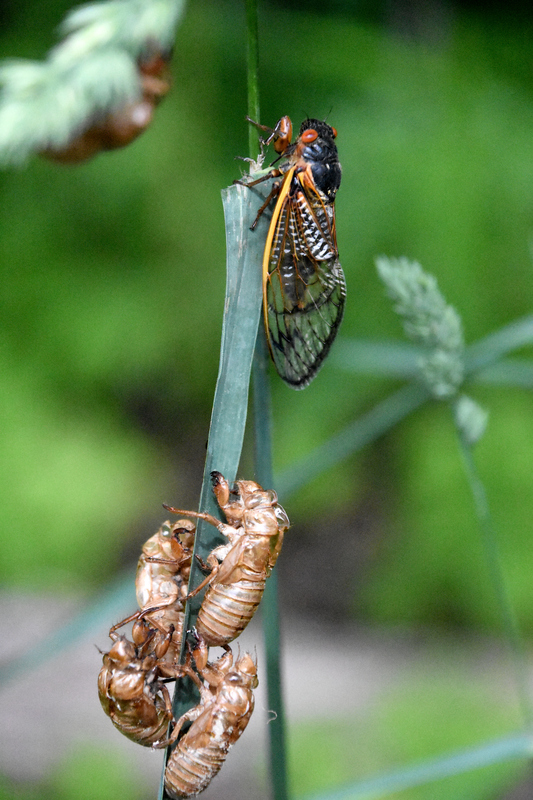 This time we took a different path and we came across two patches of cicadas. 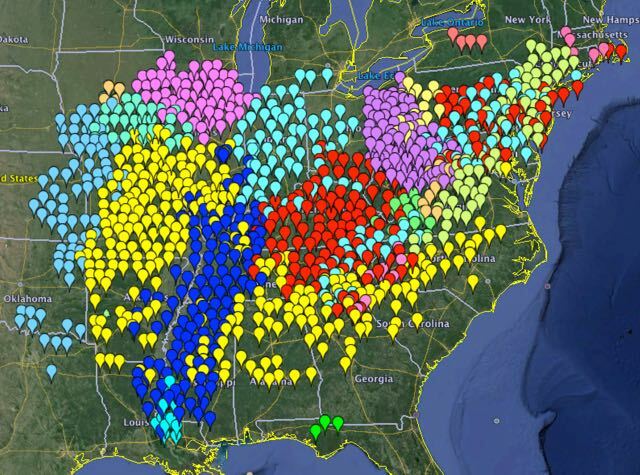 A map showing the different Broods of 17 and 13 year cicadas in the eastern USA. Brook V are the purple dots over Ohio. Each brood is on a different cycle of appearance. This map come from the cicadamania webpage which is chock full of info about these cicads including local reports of sightings. I knew we would find some yesterday because when I turned up the road to the parking lot I could hear them singing in the woods. 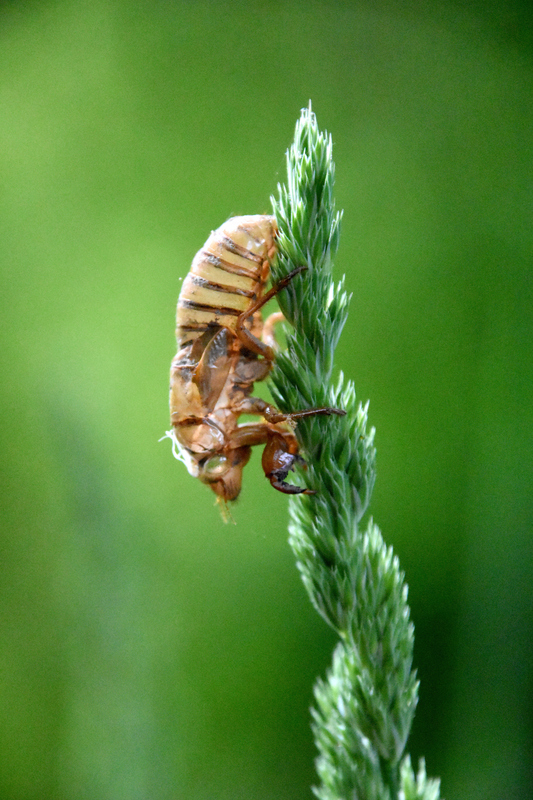 But the difficulty locating them left me with a new appreciation for how local an insect population can be. 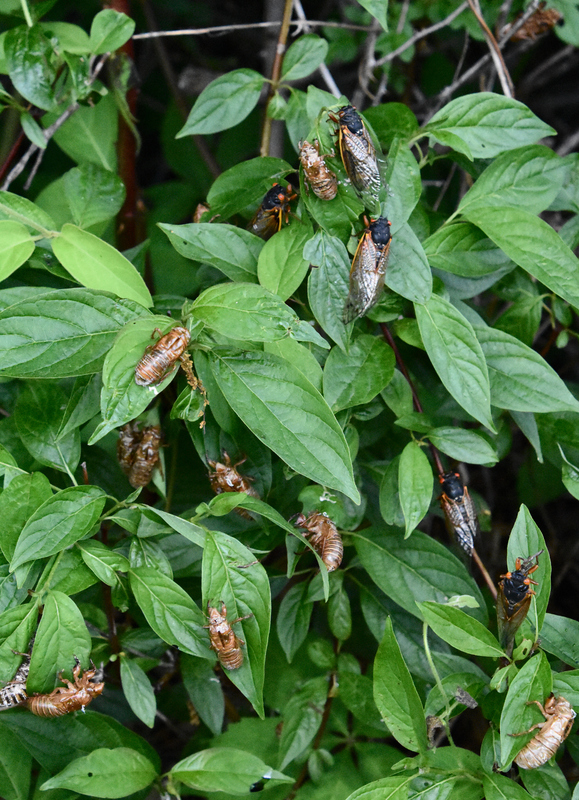 We walked over a mile without seeing a single cicada only to suddenly come upon a row of bushes literally covered with adults and exoskeletons of nymphs. 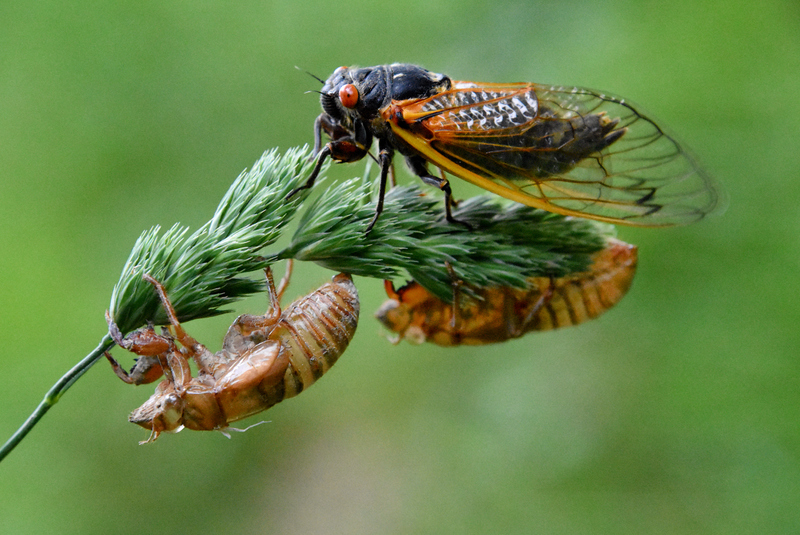 I would imagine that population was founded by a single cicada 1, 2 or maybe 3 cycles earlier. Some adults will fly out from this population to lay eggs in nearby trees expanding the population emergence in 2033 in a growing circle. Unfortunately I was late to find a population and so I missed out on the nymphs molting into adults. I had hoped to spend time capturing those steps in pictures. I had to be content with taking pictures of adults and the remaining exoskeletons of the nymphs. Click on pictures for full-sized images. I didn’t use a tripod so the full-sized images lack the resolution they could have.